Monday Madness- Win a Beatrix New York Wheelie Bag! A few years ago, my suitcase broke open sliding down the LAX baggage claim’s luggage shoot and some of its contents were thrown out. As I gathered my clothing off the conveyor belt, a man who seemed very embarrassed handed me my bra which he had picked up off the floor! From this humbling circumstance, I gained a new appreciation for this advice: it’s worth spending money on quality luggage. 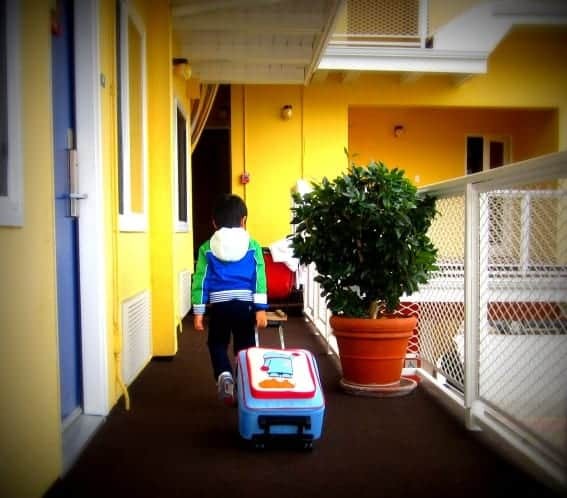 If you purchase a child’s suitcase online based purely its cutsie looks, it could end up sitting in your garage collecting dust because it’s not capable of withstanding the vigors of travel. To save money and to keep your garage clutter free, I highly recommend purchasing a Beatrix New York Wheelie Bag. Not only are these bags uber attractive, they’re also built Ford tough. Beatrix is a company devoted to creating cool, contemporary stuff for kids. Their products combine a childlike love of whimsy with a grown-up sense of modern design and style. Beatrix’s products are phthalate free, PVC free, and lead free. 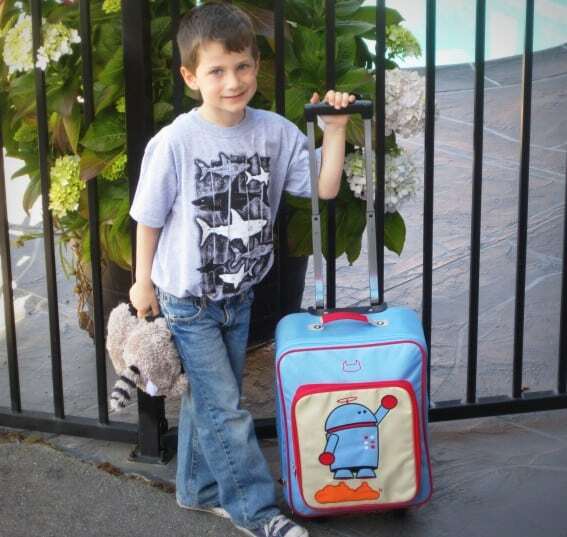 My son’s Wheelie Bag is not only adorable and colorful; it’s also the only child’s suitcase I’ve ever owned that’s actually built to be used as a suitcase! Hallelujah! This jet-setting suitcase is made of heavy-duty nylon over a sturdy frame and has an adjustable handle with multiple lock settings to accommodate his growing body. The exterior has a large zipped pocket (perfect for stashing DVD’s) and an additional zip pocket can be found in its roomy interior. Since I’ve taken all the leg work out of finding the perfect suitcase for your child, it would be a shame not to have a giveaway! Luckily, Beatrix New York has graciously offered one up as a prize; in addition, Trekaroo readers can use code TREKAROO20 to receive 20% off any Wheelie Bag purchase made until March 25, 2012! The Deal: Trekaroo readers save 20%! Details: Use code TREKAROO20 to receive 20% off any wheelie bag purchase made until March 25, 2012! The Steal: Win a Beatrix New York Wheelie Bag! Details: One lucky winner will receive one (1) Beatrix New York Wheelie Bag of their choosing shipped anywhere within the continental United Sates. In an effort to make it easier to enter, we are now using Rafflecopter. Simply click on the more link below and follow the directions. The more you do, the more entries you will receive! Every Monday, Trekaroo announces on our blog, either a fantastic giveaway or an incredible deal. It could be a green water bottle, a hotel stay on Maui or theme park tickets. Return every Monday to the Talking Trekaroo Blog for the details. Want a reminder? Become a Trekaroo member or follow us on facebook or twitter. Disclosure: I received a complimentary wheelie bag in order to complete my review and facilitate the giveaway. Beatrix New York did not ask that I state a particular opinion. All opinions are my own. Tina Buell is Trekaroo's Social Media and Marketing Manager. She is the mom of a little ray of son-shine.